When outdoors and in the wilderness, cooking can be a challenge. Preparing food while in the bush has it’s own nuances, but what about after you’re done? There are dishes to be cleaned! How do you economize on water use? What’s the best way? Not many people enjoy doing dishes, but it has to be done. With no dishwasher, sink, and limited access to clean water, it can be a challenge. However, with the right setup, it can be less of a hassle. If you are at a camping ground, they may even have dish washing facilities available. That being said, you probably shouldn’t use a bathroom sink or a water supply spigot. These areas are often busy and not designed to handle food waste. Here, we will talk about the best way to wash dishes in the wilderness, some recommended pieces of equipment/gear, and offer some helpful tips to keep your dishes clean. Thai should the whole process a little less awkward. Drying towel or cloth – You’ll need some way to dry your dishes after they are done, we recommend chamois cloth, for its absorbency. Soap – either biodegradable soap or regular dish washing soap, keep in mind though that regular store bought dish washing soap can be damaging to the environment- so keep it at away from natural water sources. Sanitizer – Somewhat optional, but for the germ concerned, a small amount of bleach or a sanitizer such as steramine(amazon) – These sanitizers claim to be more effective against viruses and diseases, and easier on the skin. Again, keep away from water sources. Sponge/brush – You’ll need some sponges and or brushes of course to scrub off caked food. The first thing to do is to do a basic assessment; how hungry are you or the people you are camping with? Not making excessive amounts of food and planning a meal that isn’t overly messy or saucy can make doing the cleanup just a little bit easier. Try and ‘clean the plate’ as you eat. This is where we use our three basins/buckets/sinks. Warm/hot water of course works the best, if you can, boil some water and cut it with some cold water to get a good temperature. Fill all three sinks about a ¼ of the way with this cleaning water. • Wash Sink – Add a few drops of your soap (preferably biodegradable) Start with the cleanest dishes/utensils and work your way through the queue to the dirtiest. Try and economize on your soap and shake/rub off excess soap suds back into the sink. • Rinse Sink – With about ¼ full of water. Rinse your dishes in this basin. Dunk them in thoroughly to get the soap suds off. If the dishes are not quite clean, or have excessive suds on them – send them back to the first basin. They should be clean of soap suds before you put them in the sanitizing sink. • Sanitize Sink – Again, fill up about a ¼ full, and use a small amount of your bleach or sanitizing agent. Soak the dishes briefly in the basin. The soap is great for food waste and the initial clean, but the sanitize sink will kill off bacteria and ensure your dishes are disinfected. If your cookware came in contact with raw meat, this will help with cleanliness. However, depending on what you made for food, such as vegetarian dish, than this might not be as crucial. Step 4 – Using your absorbent cloth – towel try your dishes. You can, weather permitting, air dry them. However this can take several hours and it may just be faster/easier to shammy off the water with a towel. No one wants to wait around for dishes to try when you could be enjoying yourself! 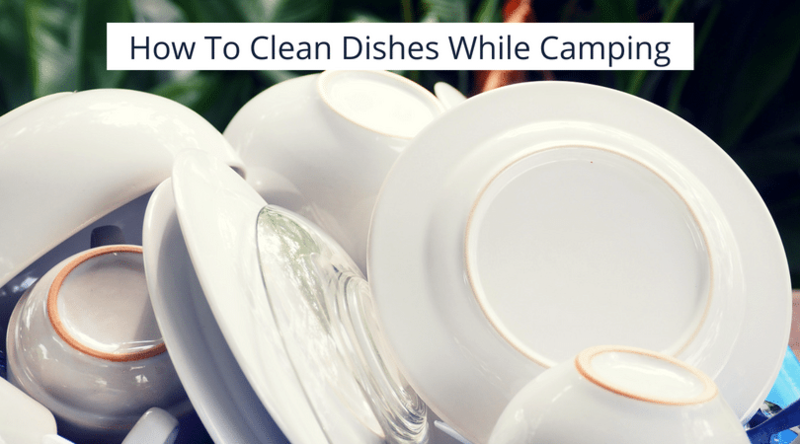 Step 5 – Double and triple check around the campsite for anymore dirty dishes. It can be frustrating once you pack everything away and dump your water to find a spoon or plate hiding somewhere. Step 6 – With the dishes done, its time to clean up your sinks. Consolidate your wastewater or graywater. First dump the sanitize sink into the rinse sink, than the rinse sink into the washing sink. Step 7 – Somewhat optional, use the metal strainer over one of your empty sinks and strain the waste water through – this will separate food waste from the water. Dispose of the food waste in your camp garbage. Step 8 – Lastly, you need to dispose of the gray or waste water. If you are at a campground, there may be facilities around for this. If those are not available to you than the next best solution is to spray the water over a large area. Try and keep it at least 200 feet or 65m away from water sources. Spreading out the water over an area, helps minimize the environmental impact.